...How many more Catgirls must die before this thread ends????? And for what it's worth, the two submissions are reminiscent of Babylon 5 and Space Cruiser Yamato in general appearance. Not that that's a bad thing. The adoption of alien tech is certainly a Babylon 5 concept, though humans tend to be (like most sentient species, I would assume) biased toward their own design philosophies. Also, I don't see anywhere in the histories of the two warring powers where they showered newfound allies with shiny new technology- particularly anything that they might have to defend against later. No, "humaniti" ain't swoopin' in with Defiant-class corvettes or Andromeda-class battleships. Our contribution, I suspect, will be on a different level. 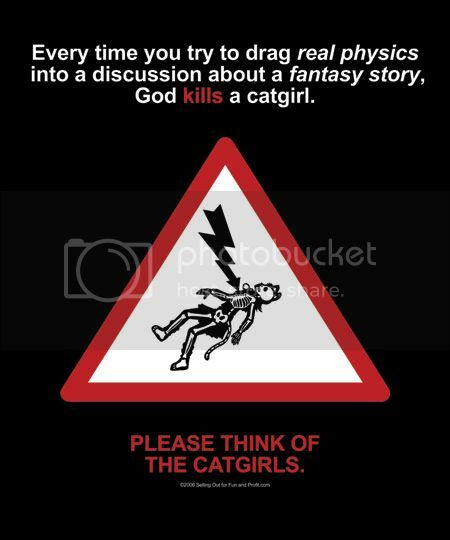 While I don't condone the killing of catgirls, I don't really think of Outsider as fantasy. Space opera, yes. Okay, I lied. I do condone the killing of catgirls. I think the concept of post-war Terran ship designs is an interesting one. I do have some back-burner notes on a possible sequel to Outsider that has some post-war Terran ships exploring the "up-arm" regions of the galaxy... if I come across some ship concepts that are not embarrassing, I'll post them. Engines can be efficent.. VERY efficent.. and the missiles can be small. I figured I would go ahead and provide a REAL world based propulsion system that humans in the Outsider universe are capable of using. That out performs other Outsider race missiles by a very very large factor(and even ship propulsion). Accurate aiming systems out to a lightsecond or more. long range beam cohesion out to a LS or more. What currently exists in the real world. The lasers capable of 100mw/s pulsed output, soon not just in the lab either. Free Electron 100mw lasers expected to deployed as antimissile system in the next 10 years by the US navy. a 14.4mw test system was able to punch though 6m of steel in in one second. We already have targeting systems required to aim a laser out to 1ls or further. Considering outsider universe states this is effective range of energy weapons and suggests that the Blaster tech suffers from beam dispersion more then laser based weapons. Such Collimaters exist in the Outsider universe. So all that terrans require in the outsider universe exists for them to create this weapon. They made need to get the Focusing technogly off the Loroi but everything else they already have, and since Terrans have long range Siege lasers it would seem they dont even need the Collimator. A pulsed laser on a ship is fired at the back of a missile which is made of solid metal, it evaporates the metal into a plasma cloud which provides thrust. Engine thrust provided is 50kilonewtons per kg of metal fuel. Lasers capable of pulsed energy output of 100mw/s provide 1000g of thrust. Missile direction can be modified by placement of the beam. Human ships need to maintain firecontrol for the missile. IF a human ship dies or pulse laser is damaged the missile becomes unguided. They have a maxium engine deflection angle to the driving laser of around 35 degrees before they can no longer be driven except by onboard thrusters if installed. They have guidance lag time, meaning for example at 1 light second 2seconds lag time so fragmentation warheads that cover a sphere with a radius of about 600m have to be used(area a enemy ship with 30G acceleration can move in 2 seconds from predicted path).. or just add a xray laser nuke. If the Laser targeting is off even slightly the missile will be knocked into a unpredictable course and missile will no longer be guided. The engine can be driven at diffrent rates allowing unequal thrusting, are very small and have massive random displacement, meaning point defence weapons cannot accurately predict its location. Attempting to target one at 0.1 LS would be hundreds of times harder then targeting an enemy ship at 1ls with near light speed weaponry. They are VERY small compared to chemical or other reaction based engines. To put the size of the fuel into perspective, Water has a density of 1 gram per cubic CM, iron has a density of around 8.3, and Osmium has a density of 22.6 grams. Assuming we use iron as its common and ignore warhead size, around 5 missiles fit in the space a single 70kg human would if we have the warhead 10kg and the fuel 90kg and want something that has a constant burn out to a light second of 110g acceleration. This isnt how you would use them however. You would give them maxium thrust up front.. save some fuel for evasive action, and then a little for the kill phase. Fire Control can be transfered to another terran craft if the first is destroyed or the engine deflection angle of the first exceedes 35degrees and another ship has a lower deflection angle. Its Very easy to make just a slab of metal with a warhead on it. Can be improved by adding onboard Ablative laser thrusters and a its own guidance system. It can be entirely self contained by adding a main laser drive, but lets assume its to complicated for mass production. Mutiple ships/lasers can accelerate a single projectile and even increase the thrust output by secondary fire on the plasma exhaust. Missiles can be launched in vollys but have thrust modified so that they can all arrive at near the same time, the the targeting lasers providing last minute corrections rather then constant thrust. Allowing the enemy to target missiles wasting fire and then the targeting computer picks the missiles that are most likely to hit and drive them home. Missiles can be retargeted if the first target is destroyed as the Missile is still has fuel and the next target is a 35degree forward cone. So a projectile weapon capable of out performing Outsider based Missiles in some ways that Outsider humans have the Technogly to create on massive scale. It has some downsides but it would allow human ships to take on outsider beam based ships and put up a decent fight, infact the missiles are MORE accurate if using a fragmentation warhead then Beam weapons, and will draw enemy fire away from the terran ships. Can cover the same distance over a light second of Umiak torpedos over 50 time faster . Terrans would have supply issues if using them on mass in system, however except for the warhead the weapon is so simple it can be produced by special craft in system, even from craft wreakage. While terran lasers may not have the power to punch though Umiak torpedos which I assume are armored and take evasive action, and would require the laser to hit the same exact spot mutiple times to penetrate, they can instead drive a missile into the path of it and shower it with fragmentation.. and when you take the speed of both together it will be VERY effective. It also is a weapon that could be real one day and is not fantasy. With the understanding that the Loroi are rather unwilling to share high-level technology, perhaps the humans could get some gear from the Historians or Barsam, since both seemed very interested in Alexander Jardin. Were I Earth's military leadership, I would focus on getting better sensors, engines, and inertial compensators/dampers. Those would improve the ability of existing human weapons to hit at longer ranges and allow human ships to avoid being sitting ducks. Noob to the rescue with content!!! only tiny texture hiccup on the tower. but there not bad if i do say so myself. Why fight fair in real time, when your FTL tech can be turned into weaponry? I bet the Umiak are just going to laugh, start flying sideways, and watch you try to push your fancy laser torpedoes into a 90 degree turn. Tamren, you maybe should have worked out the math on that one before you stated it as possible. Nice designs but I dont really see the Loroi connection in them. Those aren't supposed to be Loroi ships. Well the thread kinda switched to terran/Loroi hybrids before I and others knocked it off course, I assumed it was still part of the continued theme. the only 'part of the war effort' humans would bring, would either be as prostitutes or ground pounders, the one most certainly not excluding the other. oh, and a supply base on the flank. 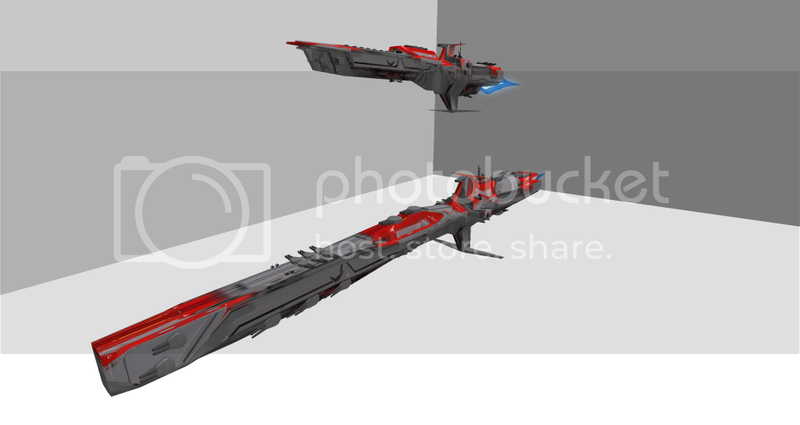 and on Terran ship design, i am thinking more along the lines of the babylon 5 nova dreadnought or omega class destroyer. I have to disagree there. My knowedge of this comic's universe may be far from complete but from what I've seen it is clear that the Loroi fleet (and doctrine) is designed around the concept of raiding a quick strikes, something completely unsuited to the war they are currently fighting. They've made few attempts, and had fewer successes, at building ships that can stand in the line (or Wall, if you're an Honorverse fan) of battle. What the Loroi need, and what the Humans can provide (assuming they can get their hands on equivalent levels of tech), is a series of ships that can take as well as they can dish out, pinning the Umiak ships in place while the Loroi are finally able to use their superior speed and range to catch the Umiak in the flanks. I'm guessing Battle Globes aren't being considered because a ball just doesn't look as interesting. TrashMan, nice...... you wouldnt happen to be known around other places as trashcan would you? With the understanding that the Loroi are rather unwilling to share high-level technology, perhaps the humans could get some gear from the Historians or Barsam, since both seemed very interested in Alexander Jardin. The Historians are a extremely tight fisted with their tech and information in general. After they allied with the Loroi; they only offered a primitive version of their plasma array when the Loroi empire was on the verge of total defeat. The Historians prefer to be information black holes. Information goes in, Nothing comes out. One nit. There is no such thing as a perfect warship. In other places (most other forums) I'm also known as TrashMan... except on those where such a name didn't fit or was taken. There I have different usernames (Firewing, Lotion Soronarr, BlackEscaflowne, etc..). Fair enough I knew a guy called trashcan who modeled ships very much like your designs, so was wondering if by chance you were him. Did I mention its the size of the sun? IT represents 30 seconds of modeling I shall never get back so people better like it. On a serious note the Quake 2 Intro warship while never actually seen in action, gives the idea of being exceptionaly hardy and has the most guns of any starship from any source of sci-fi for its size you will most likely ever see. The fighter looks pretty hardy aswell. Speaking of your ship - a sphere certanly is a interesting concept for space...but it does have some downsides. For one, it would be harder to mantain. trashman: heavier maintenance? not a certain at all, since it is a perfect sphere, the armor plates would be pretty standardized, so no extra job there, if anything less....due to larger volume to surface ratio, you could get more internals into it...making it MORE self sufficient, and have more redundancy....but it just does not look cool unless you build it in silly huge size. Oh damn, Freespace? Been a long time since I've played any of that :O FS2 is where it was at. Related, you ever hear about FreeOrion? It's an open source game based off the Masters of Orion games (actually where I heard of Outsider.) They've got some really impressive modeling going on. how so? your not really precise as were you "jump" it not like you could jump next to a ship and even less ON a ship. actually with position engine at the bow and stern i think it would turn quite nicely if those reactor are strong enough. After they allied with the Loroi; they only offered a primitive version of their plasma array when the Loroi empire was on the verge of total defeat. The Historians prefer to be information black holes. Information goes in, Nothing comes out.